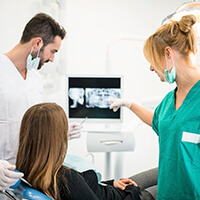 Radiography, x-rays, have been an essential diagnostic tool at the dentist’s office for decades, but digital radiography has improved the quality and accuracy of our diagnosis process by offering safer, more comfortable, higher definition images of the inner structures of patients’ smiles. This makes it possible for us to offer earlier, more accurate diagnosis and treatment planning for our patients. Unlike traditional x-rays that had to be physically developed and viewed on a special light board, digital x-ray images are immediately viewable by patients and doctors on a chairside computer monitors, making patients front and center in the treatment planning process. Dr. Timothy D. Gunnin and the Rogersville Family Dentistry team look forward to working with you to diagnose and treat oral health concerns in the earliest stages thanks to our state-of-the-art digital x-ray technology. Contact our team to find out more or schedule a checkup today. Traditional x-rays were difficult to capture, time consuming to develop, and exposed patients to high levels of radiation. Digital x-rays are a simply better way to achieve improved results. We place a sensor in the mouth that emits a tiny amount of radiation (between 40 and 90% less than traditional radiographs) and captures images of the inner workings of your smile and oral structures. These x-rays images are then transferred to a chairside monitor where you’ll review them with Dr. Gunnin. We can easily enhance the image by zooming in, rotating, or even color coding the x-ray to help patients better understand any aspect of their current oral health concerns or treatment planning. These x-rays are immediately available for dental labs, specialists, and insurance providers, which significantly reduces treatment time. Digital x-rays may be the most beneficial dental technology we’ve introduced to our Rogersville dentistry practice.